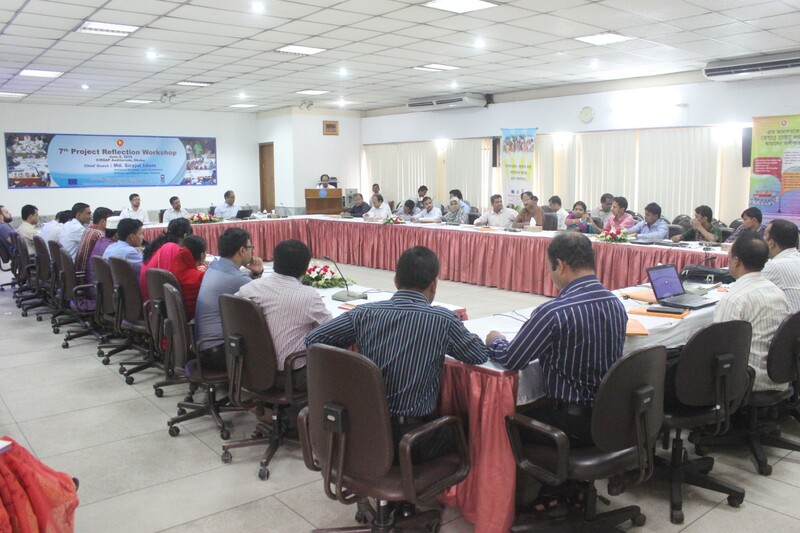 Activating Village Courts in Bangladesh project organized the 7th Project Reflection Workshop (PRW) at CIRDAP Auditorium in Dhaka on 8th June 2015. Together with the District Facilitators, selected participants from four NGOs representing 4 divisions (Dhaka, Khulna, Chittagong and Rangpur) and staff from R&PD areas the day long Workshop was enriched with the presence of Md. Sirajul Islam, National Project Director and Additional Secretary, Local Government Division, MoLGRD&C as Chief Guest. Besides, Mr. Salahuddin Khan, Programme Analyst, UNDP were present as Special Guest while Mr. Sarder M Asaduzzaman, Project Coordinator delivered the welcome speech. The PRW focused on key issues like Village Courts Management Information System (VCMIS), reviewing the periodical field progress including R&PD interventions. In his speech the Chief Guest, Md. Sirajul Islam, National Project Director and Additional Secretary of Local Government Division requested all to work as a team for the sustainability of Village Courts service. He focused on maintaining proper documentation as well as capturing and portraying the learning of current phase considering further steps for AVCB II from 2016. Sharing the expectation from UNDP, Mr. Salahuddin Khan, Programme Analyst stressed that we all should keep the current momentum of the project as flagship. He expects, the same efforts should continue in the rest of the current phase. The workshop also had inputs from the Village Courts Assistant (VCA) of 15 selected UPs responsible for piloting Village Courts Management Information System (VCMIS). On behalf of AVCB, Sarder M. Asaduzzaman, Project Coordinator facilitated the key sessions like sustainability of AVCB and reviewing latest progress. The workshop ended with a vote of thanks to all on behalf the National Project Director.